You will notice less air build up in your water mattress. Works on all Softside waterbed mattresses with tubes or bladders. It will help prevent the vinyl from drying and getting hard which could lead to cracks and seam splits. Aqua Fusion Tablets are larger than other brands. 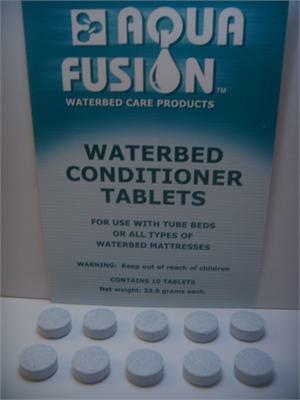 Aqua Fusion has been manufacturing quality waterbed products in the U.S. for over 35 years. S/H cost is included for all 50 U.S. States. We ship this normally with the U.S. post office with in one business day. 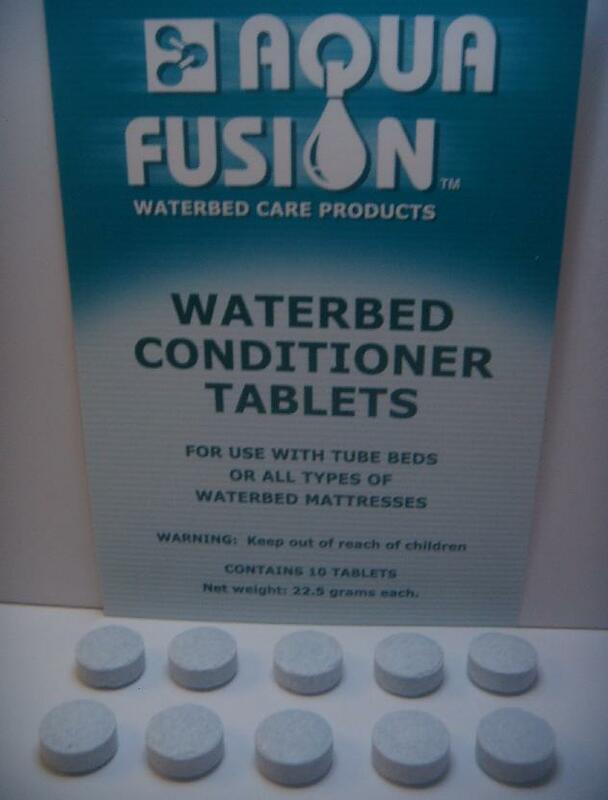 For softside waterbed tubes- Add one tablet into each tube every 10-12 months. For softside waterbed dual bladders- Add 5 tablets every 10-12 months. For Softside waterbed single free flow bladders- Add 10 tablets every 10-12 months. For softside waterbed single wave-less bladders- Add 20 tablets every 10-12 months. or click contact us at the top of the page. S/H cost is included for the 50 U. S. States. We also ship international at a low cost. Please email your location for international s/h cost. THE BEST QUALITY AT WHOLESALE PRICES.